OKAY, you can see the resort we are staying at by going to the link provided here! We're staying in the Marina, not IN the hotel! This is the link for Gran Bay Resort, Isla Navidad, Bahia de La Navidad, Colima, Mexico. We entered this bay under 25 knots of breeze going down wind and had a great time! No fish were caught along the way, however, much to my disappointment! The opening to the jetty on the south side of the bay is not obvious and it looks like a shallow bay quite frankly. We finally went there anyway, and found a very narrow and shallow area, but there was plenty of room for us to get in. We immediately saw tucked up on the cliffs and hill to the right, a beautiful resort, immaculately groomed and cared for with perfectly lined palm trees everywhere. Then, on the left is an opening to a lagoon that has a huge shoal and the point or peninsula on our left as we entered was full of tiendas, palapas, people and beach goers who could either swim in the waves on open bay and ocean side, or on the lagoon side, with but a walk over the street which was on a hill. As we entered the narrow channel we saw the opening to the marina after the resort. 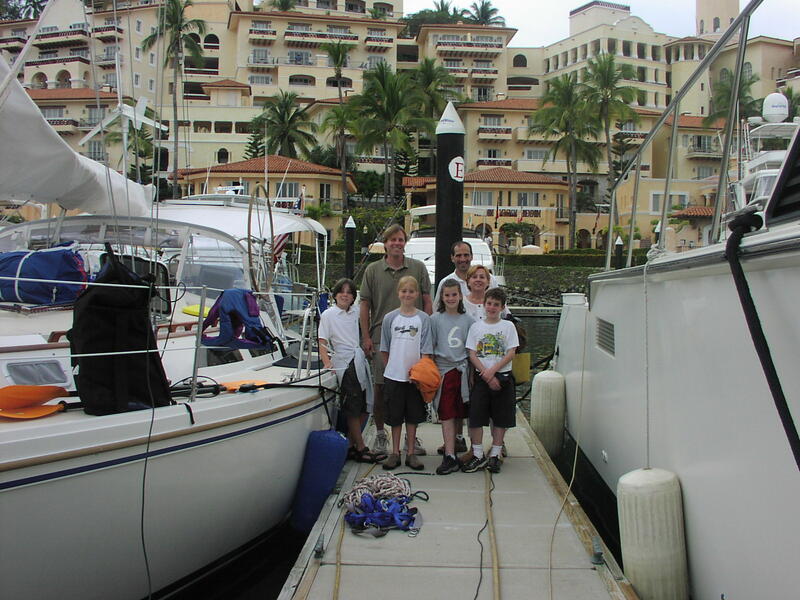 As in most places in Mexico, the predominance of sport fishing boats and large motor yachts is great. There were a few sailboats, nothing overly grand. We arrived to a friendly welcome, plenty of room. We could see that past the marina was yet another finger on our left and then a huge lagoon. There were sail boats in there but the channel is marked extremely shallow and though there are boats our size (42 feet), it appears that you would only want to navigate yourself into this lagoon with someone who had done it before, as it appears that at low tide, you could be stranded. I believe that though this looks like a quiet, large lagoon, you could only enter it and exit it for anchoring at high tides. The price would be right, though as anchoring is always free! We got to the marina and all the amenities were awaiting us. We opened an account at the resort, availed ourselves of their pool, shower facilities and laundry facilities, as well as their mail and postal facilities. All this for about $60/night, dock-side satellite television available, and all the water and electricity you can eat for that price! The hotel amenities are charged to our "folio" and we also pay about $15 US/hour to use the internet. To go into Barra Navidad, the town on that little finger peninsula when you come in, you must take the water taxi at currently pesos 15, which is $1.50 approximately U.S. and only takes about 4 minutes! However, if you wanted to drive, you would have to drive almost 40 minutes to drive all the way around that back lagoon and around the entire place to get over to Barra Navidad, the little town here in the bay. We never drove, yet we took the taxi. Internet cafes abound, with air conditioning, for about $25 pesos, or U.S. $2.50 an hour! Much better to go to town and do it. You can see the resort and the marina on the link provided at the top of the page. We leave tomorrow for Manzanillo. Kelvin and Meagan "picked up" friends at the pool, which is a three tier pool with slides between each level! Anna and Michael, and their parents Dan and Lola, live in Guadalajara and were here for the long holiday weekend, this weekend past. The country celebrated the birth of their constitution! Anna is 9 and Michael is 11 and I have never seen a better fit in families as in the four of them and us. 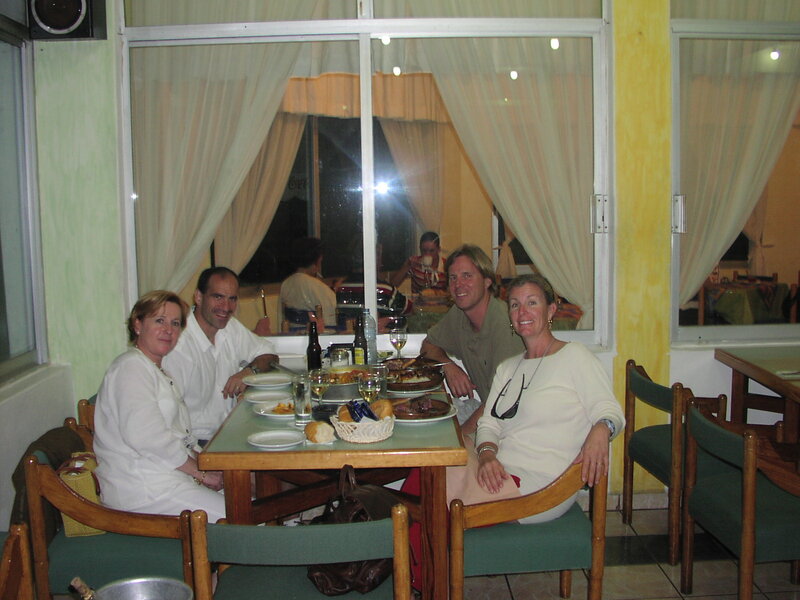 They were most gracious and invited us to dinner in Manzanillo and then drove us there to a wonderful restaurant. How jealous I was that their children eat things like octopus and my children have yet to venture that far! Lola is from Spain and Michael is from Georgia! They have lived in places like Bangladesh, Columbia, Mexico, and other places and they are on their way to Washington, D.C. as he is going to attend the Foreign Service Institute for a year to prepare to go to Bulgaria after that. We shared stories, dinner, showed them the boat, the kids played together so well, and we hope they will call us or contact us when they get to Washington and come down to Charlottesville. We exchanged communication methods and hope to see them. Their children are wonderful and extremely bright, and multi-lingual, which fascinated and motivated both of our children! A farewell on the dock. Everyone but the picture taker Letitia!